The digital landscape was very different when the site was launched in 2005 – there was no social media, so no real quick way of spreading the word about something without spending a fortune. The site was then known as Last Tackle, though was going to be known as In To Touch initially. Each page of the site was manually created using HTML and uploaded via FTP, clearly not a scalable solution. 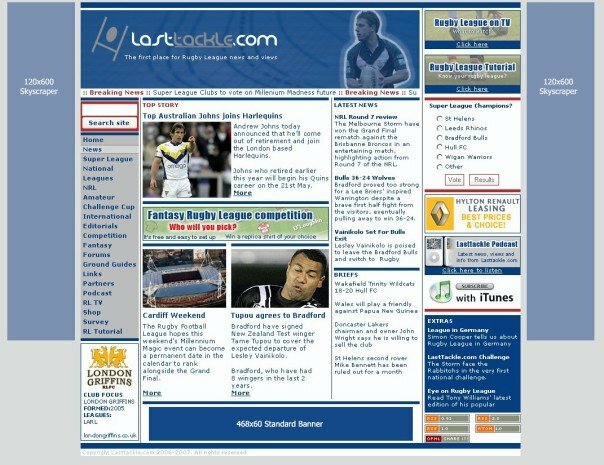 2005 – The below screenshot comes from the first month or so that the site was live. Sadly there aren’t any screenshots or archive of the site from these years; the best we can do is this mock design from 2006 which was used as a base to develop the site. Thankfully, it soon moved on to CuteNews, a very simple PHP management system, and then briefly to Mambo (a relative of the Joomla CMS), before being disappointingly hacked and deleted completely in 2008. We bounced back with a re-development on an improved version of CuteNews, before heading on to a fully bespoke management system that was developed in-house, including all of our news and stats functions. By now the site was looking really good, and starting to shape in to what it would become. 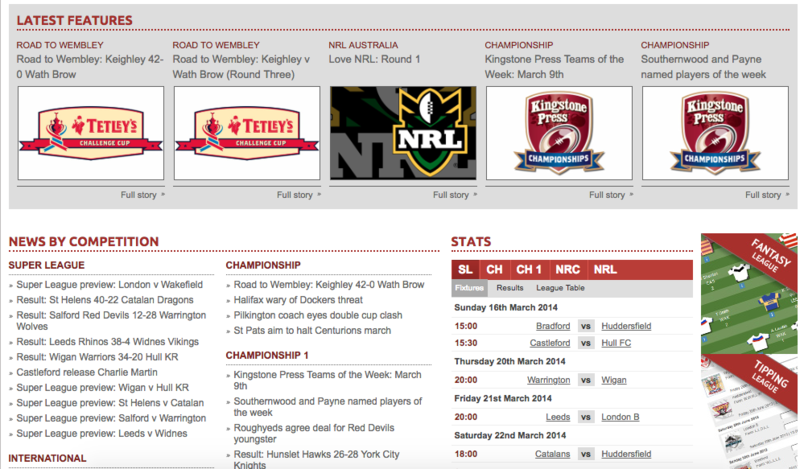 Eventually this would expand to include Fantasy Rugby League integration, automation and also mobile app functionality. 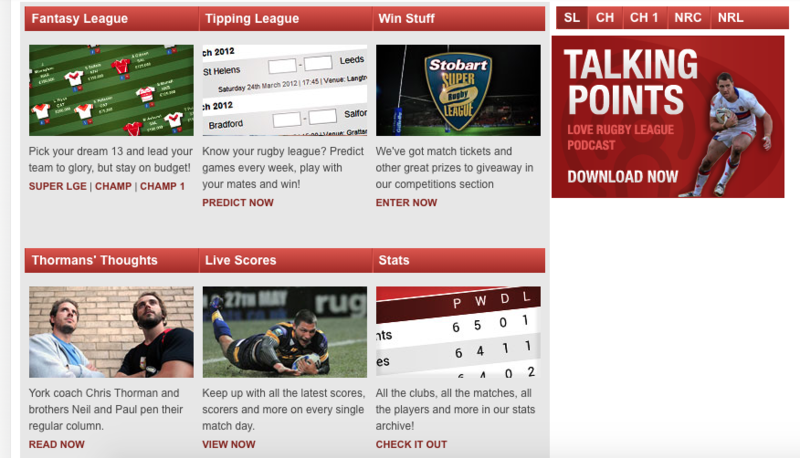 Christmas 2010 would see the site rebrand from Last Tackle to Love Rugby League; with James starting up his own business, JDG Media, he was able to devote time daily to growing the site. That included a new logo and a shift in colours, as the brand became more fan focused and social friendly. Our mobile app launched in 2011 and the site continued to grow in terms of features. 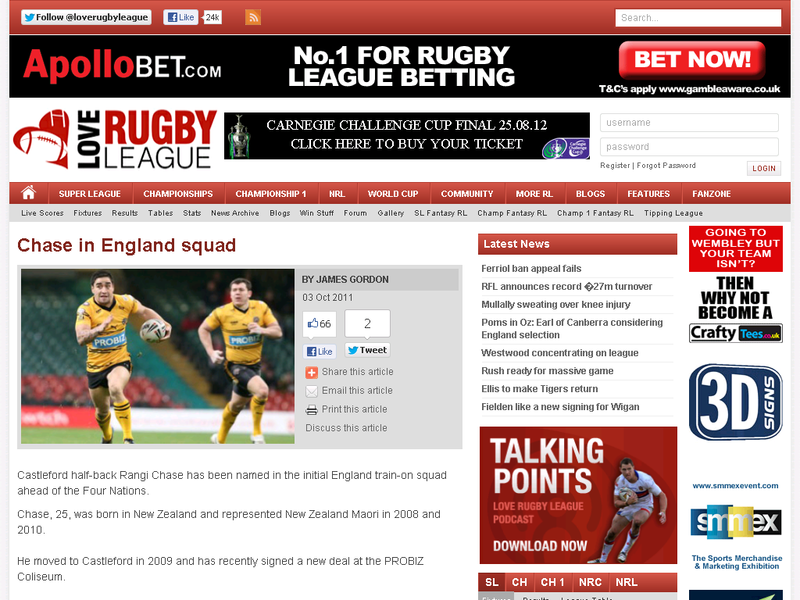 News stories were of course the main driver for the site, here is how one looked in 2012. The site continued to develop and though it largely remained the same, there were tweaks here and there to improve the look and feel of the site, as well as bring more content through to the homepage. As with many sites, as features developed it became difficult to maintain the CMS from a content requirements perspective, and soon we ended up with a hybrid CMS that included WordPress and our bespoke platform. Now the site sits within the superb Planet Sport network with many advances planned in the near future. Thanks to everyone that has supported the site over the years, either by reading articles, playing the Fantasy RL, sharing on social media or otherwise! Do you remember the site in any of the forms above? Do you by any chance happen to have any screenshots of the site? Please do get in touch!